Joyce didn't have to wait long after being released by the Indians on Tuesday. 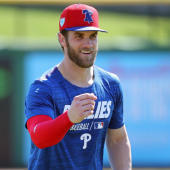 The veteran will receive an invitation to big-league camp and will have a legitimate shot to break camp with the team, given the relative lack of depth in the Giants' outfield. Even in a best-case scenario, however, he's probably looking at a platoon role, and a tough home park and poor lineup will hurt his fantasy value even if he earns unexpected playing time.